The first inhabitants of the Great Lakes basin arrived about 10, 000 years ago. They had crossed the land bridge from Asia or perhaps had reached South America across the Pacific Ocean. Six thousand years ago, descendants of the first settlers were using copper from the southern shore of Lake Superior and had established hunting and fishing communities throughout the Great Lakes basin. One of the ways that the Indians would manipulate copper was with "hammer stones." These hammer stone were found near prehistoric copper diggings in the Keweenaw Pennisula. They are prehistoric tools used 3000-5000 years ago. The Indian "miners" would build a fire over the copper vein which would heat the rock around the copper. After heating they would pour cold water on it to crack the rock. Then they would pound out the copper with rock hammers and stone chisels. These hammers usually had a handle attached to them. Some hammers were held with the hands and were not grooved. When they broke they tossed them aside. Grooves were put in the hammers with smaller stones. The hammers are found today, underground, anywhere from 6" to 3'. It is hard work digging for them. The copper was shaped into spear points, arrow heads, knives, harpoons, and jewelry. The native people occupied widely scattered villages and grew corn, squash, beans and tobacco, and harvesting wild rice. The states indigenous peoples-its first true farmers-supported themselves through a combination of hunting and gathering and simple agricultural techniques. Their modest plots produced corn, beans, peas, squash, and pumpkins. However, the Indians used only a portion of their holdings for crops and so caused few lasting changes in the countryside. They moved once or twice in a generation, when the resources in an area became exhausted (GLERL 1995). Those not in villages were scattered throughout the beautiful but inhospitable pine forests of the north. Villages were relatively impermanent and, except in two or three very populous areas, widely separated from one another. The crude and primitive means of subsistence that the Indians had at their disposal seriously limited the number that a given area could support. The greatest concentration of population coincided almost perfectly with the area of deciduous forest. Maple and birch were the two most valuable trees: the first for its sugar, the latter for housing material and canoes. Other sources of food supply, such as game, wild apples, plants, and berries, as well as land suitable for agriculture, were more likely to be found in the deciduous than in the coniferous forest lands. A majority of Indian settlements were along waterways, as in the St. Joseph and Saginaw River valleys-then the two most populous areas. Water provided an easy means of transportation and, in fish, a plentiful supply of food. Some settlements along the Lake Michigan and Lake Superior shores were regularly occupied in summer and abandoned for more sheltered positions in winter. Native American Indians were the first to use the many resources of the Great Lakes basin. Abundant game, fertile soils and plentiful water enabled the early development of hunting, subsistence agriculture and fishing. The lakes and tributaries provided convenient transportation by canoe, and trade among groups flourished. By about A.D. 100, Native American inhabitants of the Upper Peninsula (Ojibwes) were using improved fishing techniques and had adopted the use of ceramics. They gradually developed a way of life based on seasonal fishing which the Chippewas/Ojibwes still followed when they met the first European visitors to the area. Scattered fragments of stone tools and pottery mark the location of some of these prehistoric lakeshore encampments. The above picture shows Native American Indians at a camp on Mackinac Island in 1870. 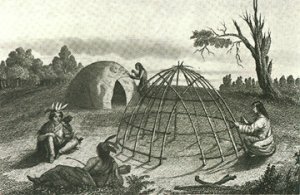 The picture is a bit misleading, however, since most Native Americans in the Great Lakes region lived in hogans or wigwams like the one shown below, not in teepees. Source: Pictorial History of Michigan: The Early Years, George S. May, 1967. Archeologists often find their projectile points and arrowheads, indicating sites where they hunted or camped for extensive periods of time. But for the most part, evidence of Native American cultures in Michigan is not great. Native Americans lived and traveled primarily along water routes and water bodies. Thus, as of about 1670, much of the dry inland areas of Michigan were essentially unoccupied (see map below). Inland Michigan was used almost exclusively for travel, not to live. It was a place to cross, not to live.